Kate Humble presents the ruddy duck. Kate Humble presents the ruddy duck. Ruddy ducks are natives of North America. In the late 1950s and early 1960s several ruddy ducks escaped from the Wildfowl Trust's collection at Slimbridge and within 30 years they had become established breeding birds in the UK. Some even migrated to Spain where they mated with a very rare threatened relative, the white-headed duck. 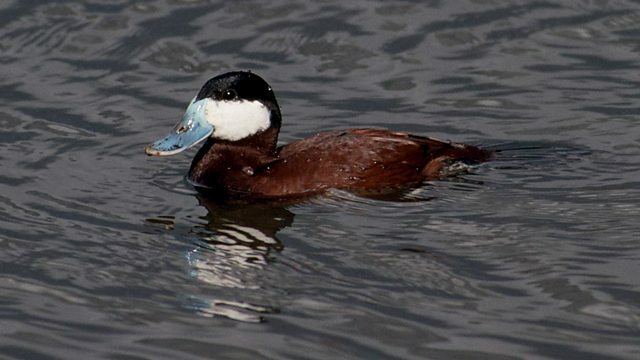 Many ornithologists believed that the resulting hybrids threatened to undermine years of conservation work in Spain, so after taking scientific advice, the UK government set out to eradicate the ruddy duck. This action has reduced our population to a handful so your best chance of hearing the courtship display is by visiting a wildfowl collection. Webpage image courtesy of RSPB (rspb-images.com). This programme contains a recording of a ruddy duck kindly provided by The Macaulay Library at the Cornell Lab of Ornithology.